For only the second time since PEJ began measuring social media in January 2009, the same story was the No. 1 topic on blogs, Twitter and YouTube. Social media users last week responded in huge numbers to the aftermath of the catastrophic earthquake in Japan, including the growing concern about damaged nuclear reactors. For the week of March 14-18, a full 64% of blog links, 32% of Twitter news links and the top 20 YouTube news videos were about that subject, according to the New Media Index from the Pew Research Center’s Project for Excellence in Journalism. The only other time that one topic led the news on blogs, Twitter and YouTube was June 15-19, 2009, when unrest following the disputed elections in Iran-also known as the “Twitter Revolution”-was the No. 1 story. While all three social media platforms focused on the earthquake last week, each performed distinct functions. The blogosphere offered a place to release and share emotional responses to the disaster and calls for support for the Japanese people. Twitter became a place to seek out and share breaking news as users retweeted stories from news sources. YouTube, the visual medium, captured the astonishing visceral power of tsunami waves that destroyed virtually everything in their path. In discussing the repercussions of the earthquake many bloggers shared optimism that Japan would recover from the disaster and asked their readers to think of those in that country. “This is a time of incredible stress but also a time for Japanese society to re-evaluate who they are and what makes them special. I have great hope and optimism for the people of Japan,” wrote Ian Kennedy on everwas.com. Other bloggers expressed shock at the magnitude of the disaster (or disasters) that struck the island nation. “One big earthquake is bad. One big earthquake plus one big tsunami is really bad. One big earthquake plus one big tsunami plus one explosion at the nuclear plant is really, really bad. One big earthquake plus one big tsunami plus one explosion at the nuclear plant plus a second explosion at the nuclear plant and you’re talking real trouble,” wrote El Hornito at Scattershot. And some bloggers noted how modern media coverage can bring the horror of such events to everyone across the planet-the shrinking of the global village. “Events like this are no longer just stories that happen to foreign people in a far foreign land. They happen right here, right now, in our own living rooms in every place on Earth,” said Andy Mayhew at Weather & Earth Science News. Those on Twitter devoted more attention to news as it happened than to the broader picture, many of them focusing on the changing conditions at the crippled Fukushima plant. “What? Earthquake & tsunami not enough?” tweeted dengshot, linking to a BBC article on Fukushima workers withdrawing after radiation spikes. “two hopes; for enough supplies to reach in NE Japan where facing bitter cold weather, Fukushima nuke plant to come under control,” tweeted Pok Mu in response to a March 15 BBC article about radiation rising at the Fukushima nuclear plant. “What about the Japanese people?” Jonathan Poile asked when tweeting a March 16 BBC article about radiation fears prompting foreign firms to move employees. Every one of the 20 most popular news-related videos on YouTube last week showed footage of the tsunami waves overtaking Japan. The horrific images of cars, homes and entire towns being overrun by walls of water garnered millions more views than the top videos get in an average week. The No.1 video had 12.7 million views and the second, 8.1 million, compared to a normal week’s average of between one and three million views for the leading video. Many of the clips were from NHK World, a Japanese news channel, but were posted by other news sources, including Russia Today and the Associated Press. The violent videos showed the power of the tsunami, and since many were short clips, lent themselves to the YouTube format, giving people a powerful snapshot of the disaster as it happened. 1. Tsunami wave hitting Sendai airport on closed circuit television. 2. Tsunami slamming Northeast Japan. 3. Tsunami battering ships, homes and cars. 4. Tsunami wave eats boats as earthquake hits Japan. 5. Helicopter aerial view of giant tsunami waves. 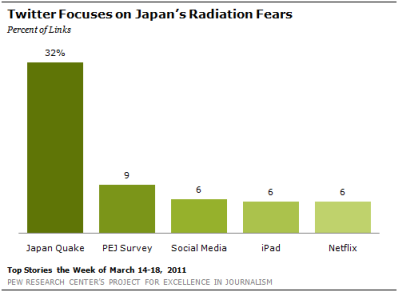 The focus on the disaster in Japan last week was the second-biggest story on blogs since PEJ began tracking social media two years ago-trailing only the economic crisis (65% of links) the week of March 16-20, 2009. This attention relegated another major international story to very secondary status in the blogosphere. The No. 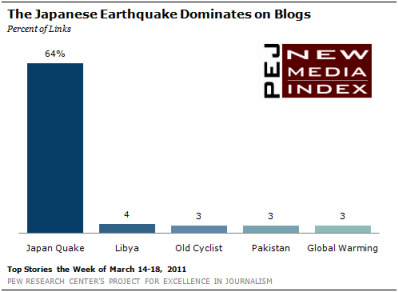 2 subject on blogs was the fighting in Libya and the U.S. entry into the war, with 4% of blog links. Many bloggers linked to an opinion piece by General Wesley Clark arguing against U.S. military action. The majority of posts discussing Clark’s op-ed were complimentary, even for those who did not concur. “While I disagree with his conclusion…Gen. Clark raises some excellent points,” wrote Ben at D.C. Exile. Next, at 3% of the links each, were three separate stories in the Los Angeles Times. One was about a 103-year-old man who rides a tricycle almost every day. The centenarian inspired bloggers: “I’m not sure if he knows this or not but as he pedals along, he’s testament to one of Satchel Paige’s most enduring of the ‘Rules For Staying Young,’ which is, ‘And don’t look back-something might be gaining on you,’ ” Wrote lawmrh at The Irreverent Lawyer. The other two included the story of a CIA contractor who was released from a Pakistani jail after being acquitted of murder charges and an article on Republican lawmakers in California threatening to withhold votes on Governor Jerry Brown’s budget unless environmental rules were rewritten to curtail lawsuits, grant waivers to telecommunications firms and exempt urban developers from environmental review. Last week’s No. 2 subject on Twitter was a Mashable story about PEJ’s annual State of the News Media report, with 9% of links. The rest of the top stories (all coming from Mashable) included one about measuring social media (6%) that discussed the limited access to social media that data professionals in that field face. There was also a piece about the iPad 2 selling out (6%) and a story about Netflix distributing an original TV series starring Kevin Spacey (also 6%).